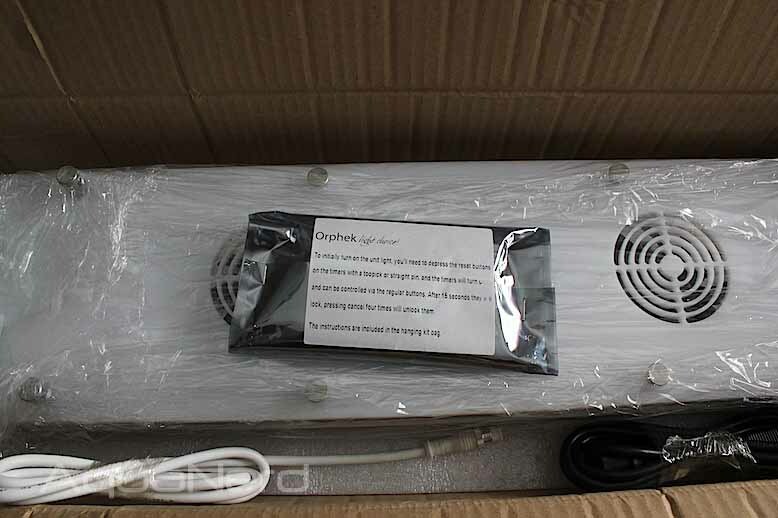 We recently got our hands on the stylish and powerful Power Reef 156w PLUS (or PR-156w+) LED fixture from Orphek, and even though we haven’t had a chance to suspend the lights over a tank just yet, we wanted to take the opportunity to share its unboxing and our initial impressions. To start, we’ll discuss the packaging and then move on to the light itself. Since we’ve had such limited time with the light, we won’t go into much detail about the light’s operation, though it’s something we will certainly touch on. After we have had some significant time with the light, we’ll post PAR readings and a video demoing its use in future articles. Getting back to the light, the PR-156 was shipped in a non-descript box with plenty of foam packing material to keep the components in tact and free of scratches. The fixture and the controller box were both individually wrapped in plastic and placed in separate compartments within the box. The light arrived in absolutely perfect condition. After removing the packing supplies, we drooled over the sleek fixture in all of its glory. 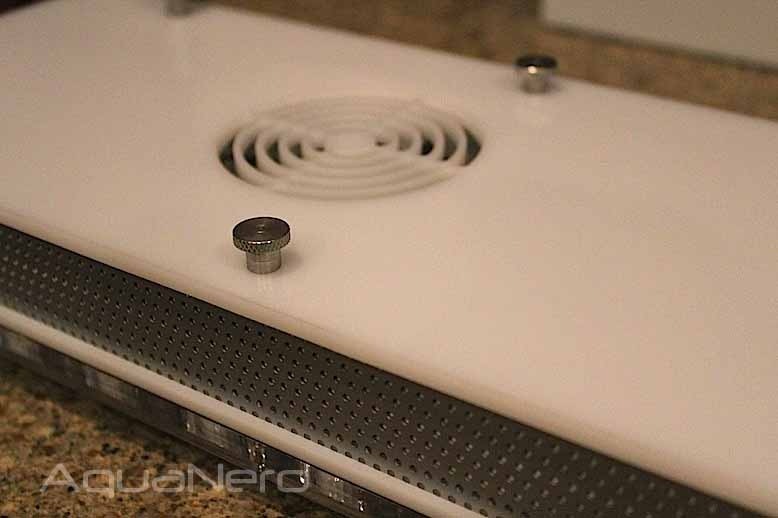 The clean white body and acrylic shield are very appealing visually, and the moutning hardware on the top is unobtrusive. 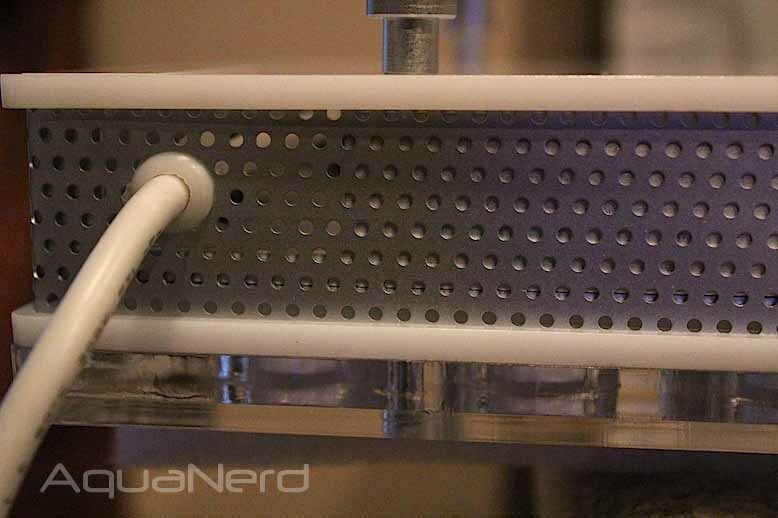 From purely an aesthetic standpoing, Orphek has themsvelves a beautiful fixture that rivals that of the best the aquarium industry has to offer. But how does that translate functionally to our aquariums? 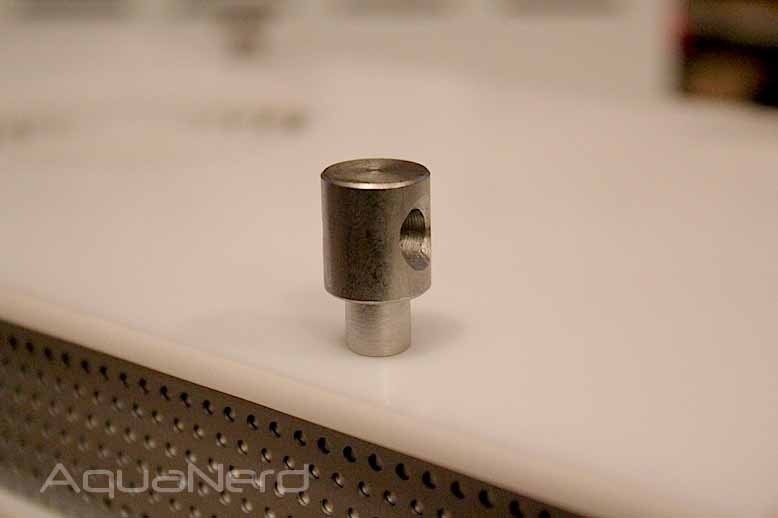 Once the box was opened, we briefly glanced at the directions and started plugging things in. The light connects to the driver box through a single cord with screw on connectors, which is a nice feature. 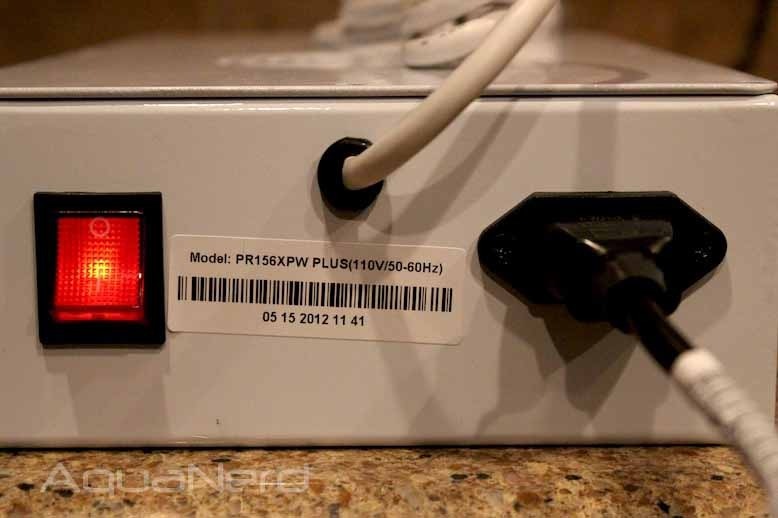 The driver box plugs into a standard three-prong wall socket, and from there the settings on the timers can be adjusted. To do the adjusting, we removed the protective plastic cover from the front of each timer and started tinkering away. The screen on each locks when not used, but by pressing the cancel button four times, we were unable to unlock it and adjust the time that the lights turn on and off. 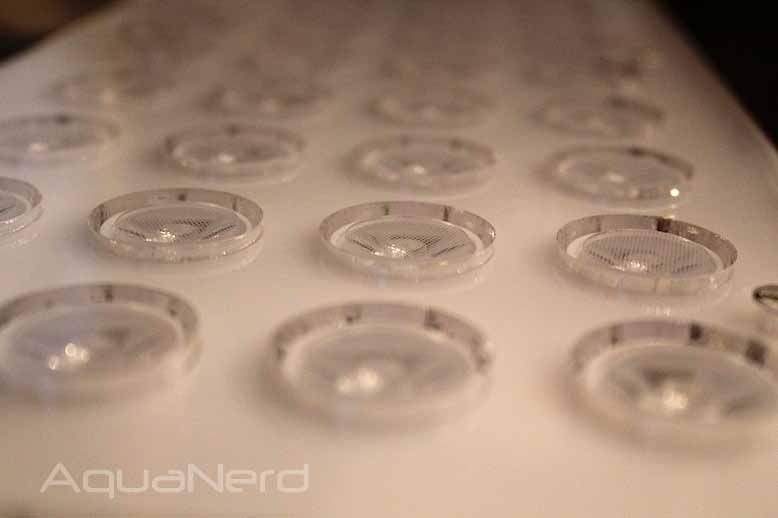 It’s a simple solution to keeping our fat fingers from accidentally mashing buttons when the light is set just the way we want, and the plastic covers keep the delicate electronics free from splashing water and potential scratches from being moved around. 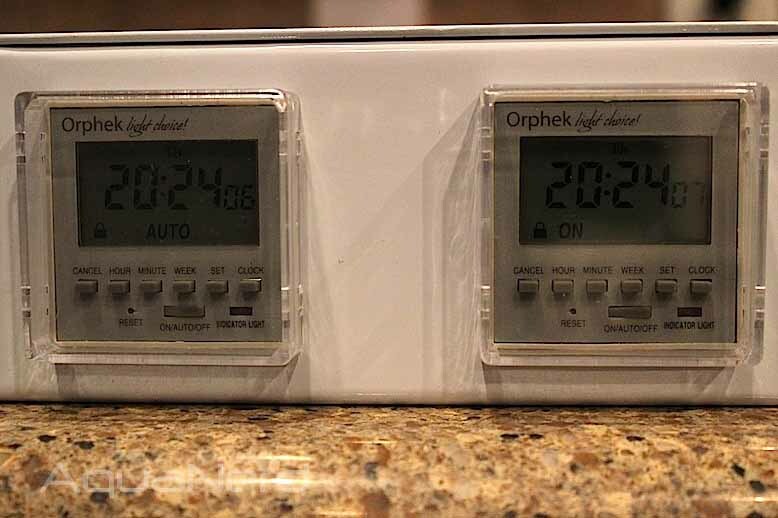 In terms of functionality, each timer has 16 different entries with each of those controlling the time that the LEDs turn on and off . That’s 36 time points for each channel, which in our opinion is a bit of overkill considering the fixture only has two controllable channels, but we still haven’t explored all of the possibilities of this fixture quite yet, so we’ll reserve our judgment on that aspect. After we set the time and date, which took all of about 5 minutes and almost no glancing at the instructions, we flipped the switch on the light and were greeted with a blinding array of color. 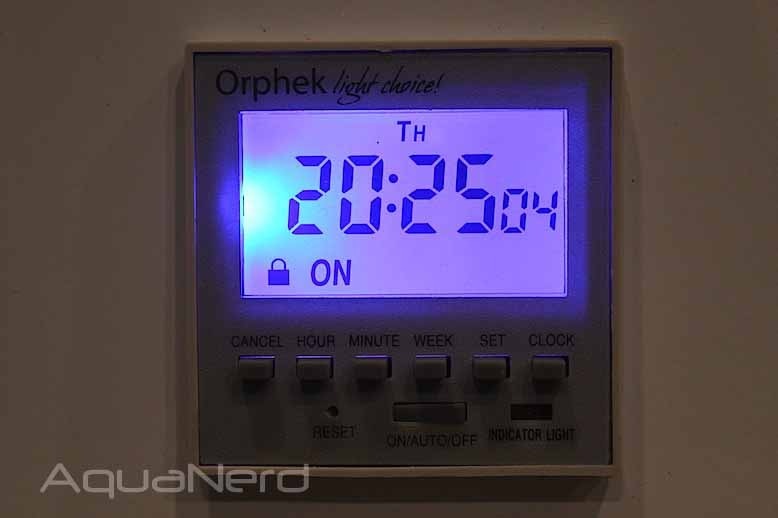 Even though the fixture has the elaborate timers, Orphek kept things super simple with the single power switch, which we love. Once the timers have been set just right, hobbyists can turn the PR-156 off and on with a simple flip of the switch and without having to navigate through any menus or remember any sequences. Of course, the timer automatically turns the lights on and off during the day, but in our situation where we’re just playing around, the switch came in very handy. Additionally, we could definitely see its value when needing to turn the light off in a hurry when tinking in the aquarium without running the risk of messing with any of the settings. With the light fully illminated, we could really see the power the Orphek has to offer. 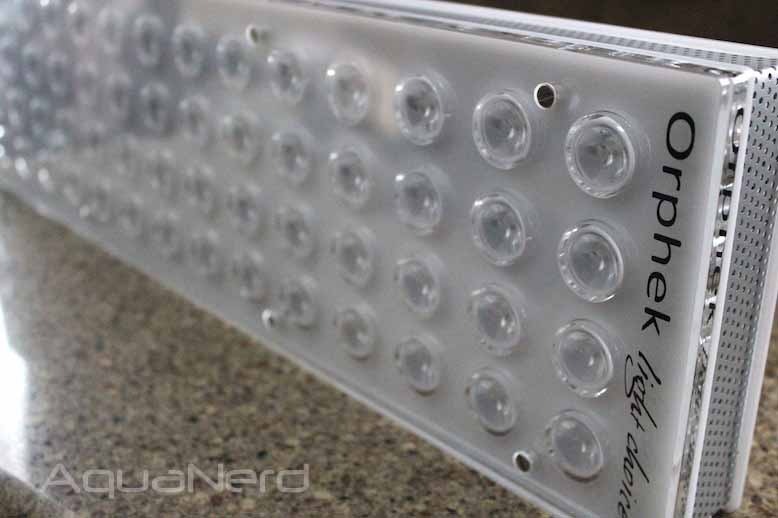 The LED lineup includes white, blue, UV and red emitters in the same layout as the Orphek Nilus fixture, and 120 degree honeycomb lenses help spread that light out. We haven’t had a chance to measure the output with our PAR meter, but let’s just say the light is intense. It fully lit up a desk area from 15 feet away, and we’re sure that will translate into good water penetration. But, we can’t be certain until the PAR meter gets a good workout. So far, our impressions are very good. 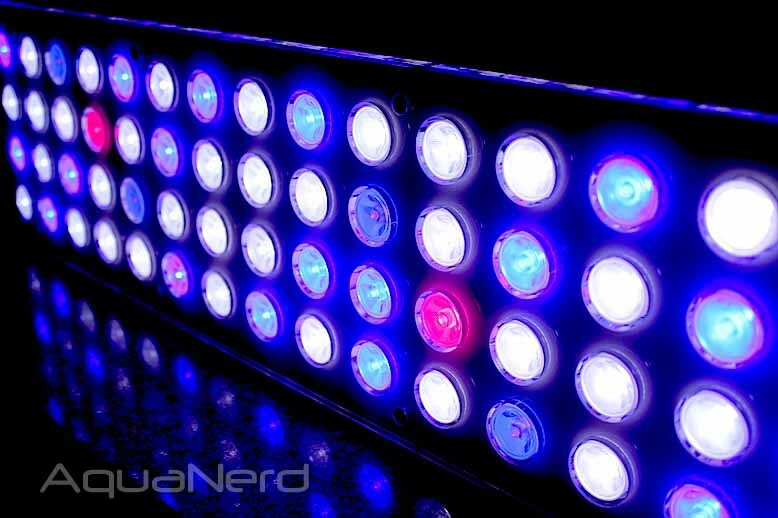 The light is solid and bright, and we’ll be hooking it up to a reef tank soon to get an even better idea of how the PR156w+ performs. Until then, be sure to glance at the images of the fixture below.